Looking for a quick baby gift already gift wrapped? These baby cupcakes look good enough to eat! 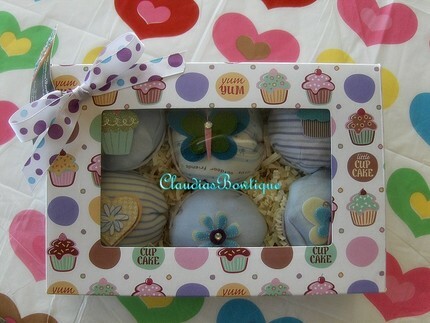 They are made of layette pieces packaged inside a real cupcake box. 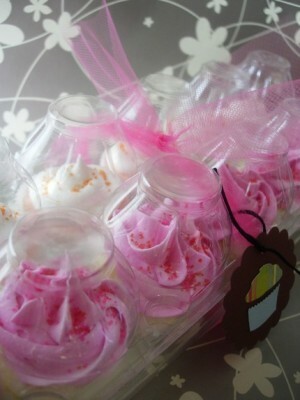 Each 6-pack cupcake gift box contains: (3) onesies, (2) bibs, and (1) wash cloth. All the baby garments are cleverly decorated ……well….like cupcakes. Available in colors for girl (pink), boy (blue), and yellow (neutral). 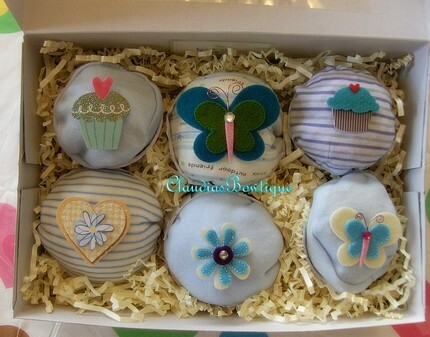 Baby Boy Layette Cupcakes are decorated with blue embellishments and gift wrapped with ribbons. 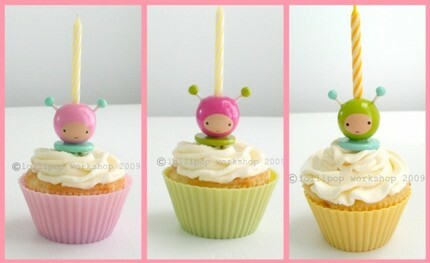 Add more happy to the party when you stick one of these little spacedwellers in your cupcake! 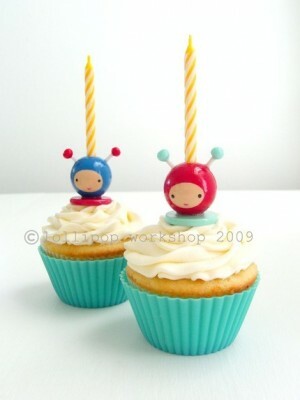 The listing is for ONE spacegirl or spaceboy candleholder. Choose from colors red, pink, hot pink, aqua, lime, or blue. A candle will be included, but regrettably, the cupcake will not. Approximately 2” tall. handmade. handpainted. tripley sealed. reusable. easy to clean. simply wipe with a slightly damp cloth. (immersion not recommended.) Meant for decorative purposes only, not as toys. contains small parts. please keep away from little ones. The Note pad is a 30-sheet 80 GSM memo pad that measures 4 x 6. 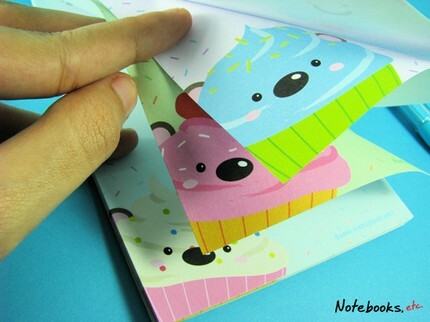 This adorable memo pad was illustrated, printed, and bound together by me and features THREE DIFFERENT PAGE DESIGNS– Birthday Cupcake Bear (on light blue background), Strawberry Surprise Cupcake Bear (on light green background), and Vanilla Sprinkle Cupcake Bear (on light purple background). How cute are these! 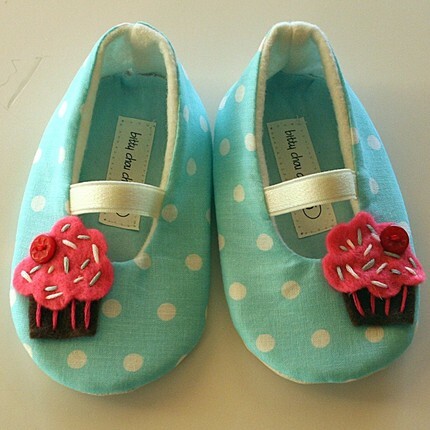 Cupcake party shoes- a beautiful robin’s egg blue with white dots. Embellished with a yummy cupcake – sprinkles,cherries and all! Sizes 6mo and older, have a grippy non slip material on bottom. Smaller sizes have a matching fabric instead. Perfect for inside parties, church, special occasions, and limited time on grass or cement. 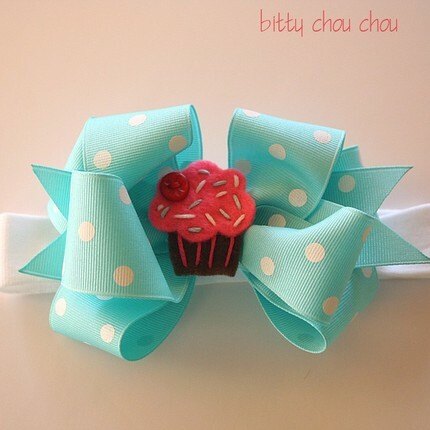 The Cupcake party bow is Robin’s Egg blue with a sprinkle cupcake, topped with a cherry – yummy! Secured to a white cotton headband. Fits 3mo – 3T. This necklace features three cute mini charms on a fine, gold plated chain. 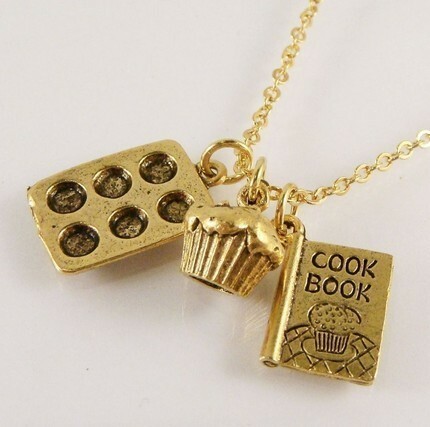 The charms are a mini cookbook, a cupcake, and a cupcake pan! The charms have an antiqued gold finish. 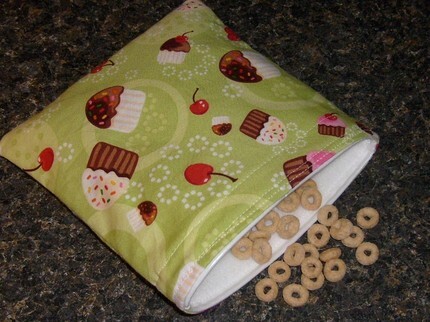 Great for cupcake lovers, or anyone who loves sweets and baked goods! Get your fresh cupcakes! These mini cupcakes are bubble bath bombs. Its a perfect favor or just a nice little stock of your favorite bath scents! 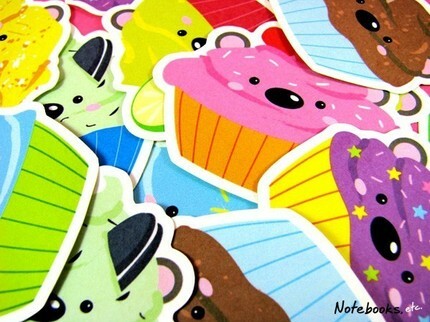 You will receive a total of 12 cupcakes. You choose 2 scents and I will create 6 of each scent. They are the same size as the beloved edible mini cupcake. 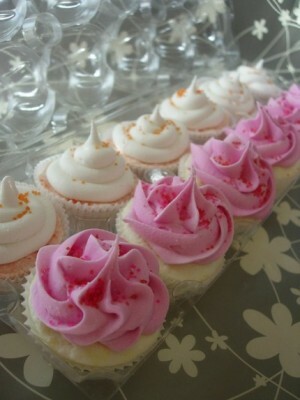 Cupcakes in photo are Strawberries & Cream and Dreamcicle. These cupcakes are actually good for you – containing ingredients for soft smooth skin. Just drop it under the running bath water and soak your cares away.